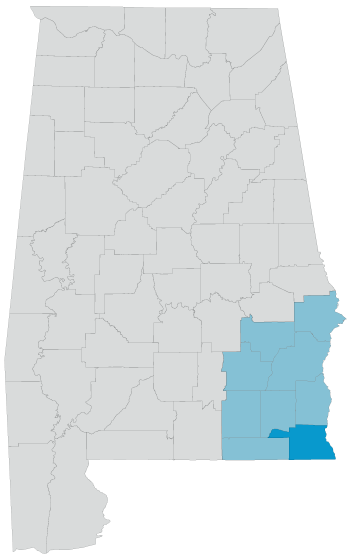 Houston County, with Dothan as its largest municipality, serves as the hub of the larger Wiregrass area. It boasts a population of over 101,550 residents, which almost doubles during working hours as many residents from surrounding communities travel to Dothan for work, healthcare, and banking services. The cities and towns in Houston County include Dothan, Ashford, Cottonwood, Columbia, Cowarts, and Gordon. Houston County is home to the National Peanut Festival, which is held every year to coincide with the fall harvest. Houston County also serves as a major transportation hub for the Wiregrass region. US Highways 231 and 431 serve as major corridors to north-south traffic while US Highway 84 serves people traveling east and west. All of these major highways converge in Dothan, AL.